And especially when saying goodbye — the softness of Ciao in my ear — comforts me, and reminds me that, “we will see each other again soon, it won’t be long, and you will be in my heart, until then“. 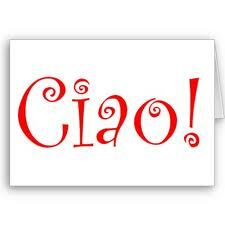 All of these feelings are wrapped up in that one wonderful, little word….so Ciao my friends!! I’m so glad you are here! I felt it was time to move onward from the myhalfmarathonjourney blog I had on WordPress. It has served me soo well for almost 2 years, WOW! How time flies. Yet as I completed the Disney Marathon a few weeks ago, and began to plan “what comes next”, it became immediately obvious to me — that whatever does comes next…..will be much much more about the journey, than the destination. Then again, as L.I.F.E. goes…..it’s very rarely about the destination anyway. My destinations, so far — the Unite Half Marathon, even the Disney Marathon — have been useful markers on the ground….markers to get me moving forward. First, to get me off the couch. Then to the Mailbox. Walking the dogs. Around the Block. To My Bike. To my 1st 5K. To Rutgers and a Unite-d 13.1 miles. And finally to Florida, and 26.2 Magical Mickey Miles. The journey has been about Moving Forward. Moving forward has been scary for me. Mainly, because I didn’t KNOW where I was going. So if we want to talk about C.H.A.N.G.E that has nothing to do with pounds, or points, or miles — then the single biggest change that resulted from my journeys so far — has been the journey of leaving Fear behind. I Am Less Scared Of Moving Forward Into the Unknown Than I Was Before. Hey, I’m not Fearless — not yet. But we’ll see what comes ….with time. So, Welcome. To our new Home, Ciao for now! All the posts from my old blog have been carried over to here. So we’ve left nothing behind. We’re blessed by the learning of our past, the strength of our present, and the promise of our future! So please, Come often. Stay long. Tell friends. And please comment, comment….comment and join in. Our journeys are intertwined. Where we are going, isn’t nearly as important as the fact that we ARE going….together!